By Dan Ambrose: WBO light heavyweight champion Sergey Kovalev’s trainer John David Jackson has been saying that Kovalev will prove that the 49-year-old Bernard Hopkins (55-6-2, 32 KOs) is an old man and will beat him with pressure when they get inside the ring on November 8th at the Boardwalk Hall in Atlantic City. Jackson has been teaching Kovalev things he learned from his own fight against Hopkins back in 1997 when Jackson was knocked out in the 7th round. Hopkins was much younger when he fought Jackson 17 years ago, and it’s impossible to assume that Hopkins can do the same thing to a much younger fighter like Kovalev. Things are different. Hopkins is older, slower, and easier to hit now compared to when he was fighting at middleweight in 1997 against Jackson. Additionally, Kovalev is a bigger puncher than Jackson, and a bigger fighter. 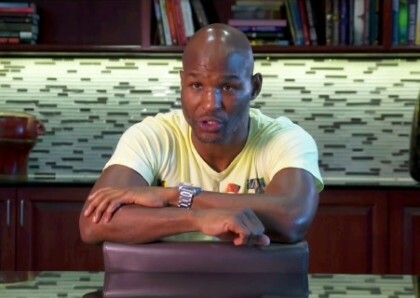 Hopkins is facing the hardest puncher of his career while nearing 50. It’s a combination of things that could lead to Hopkins taking a beating in this fight, and getting knocked out. If Hopkins is able to go the full 12 round distance against Kovalev on November 8th then it’s going to mean that Hopkins will need to be able to take a lot of punishing head shots. He’s not going to be able to shoulder roll, duck & dodge all of the big shots that Kovalev throws at him in this fight. If Hopkins doesn’t get knocked out, he’s still going to have a very difficult time trying to win rounds, given that Kovalev will be throwing more punches with much bigger power. Hopkins no longer throws a lot of shots, and he’s not a big puncher. This means the only way Hopkins can somehow win rounds is if he ties Kovalev up with clinches over and over again so that he can’t get his punches off. In other words, Hopkins will need to throw a single shot and then grab immediately to smother Kovalev’s work rate. He’ll need to stay close to him in all 12 rounds to try and smother his attack. Hopkins can’t move for 12 rounds, because he’s too old.